The HCS meeting at Gota de Leche ended shortly before lunch. And as expected, when there is a large gathering of heritage buffs, an impromptu adventure is in the works. And guess where we decided to go?! Yup, it was a three-in-one afternoon since it was off to three of Manila's historic cemeteries. And we had the best tour guide to take us there, none other than Binondo's street walker and my tokayo Ivan ManDy. With us was Prof. Jojo Mata and Chinatown heritage denizen Jeffrey Yap. You must be thinking we were all crazy! Why would someone in his right mind visit cemeteries for a leisurely afternoon adventure. 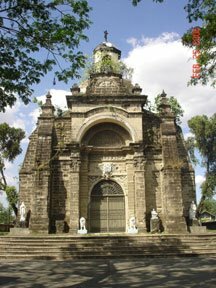 Well, the answer is simple... these old cemeteries are the last bastion of Philippine architectural history. They were one of the few areas that were not bombed during the Second World War for obvious reasons which is why the architectural treasures inside were preserved for this generation to see. 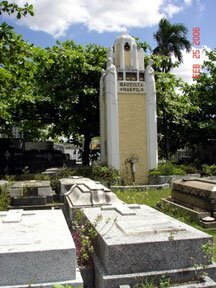 In fact, a visit to these three cemeteries should be an SOP, a must if I may say so, for any architectural history class since all architectural styles that ever reached Philippine soil from the 1870s to the present are represented in these cities of the dead. From the grand to the whimsical, the numerous mausoleums give today's generation a picture of how rich Philippine architecture was before and shortly after the war. 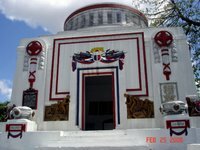 Indeed, this necropolis is a time capsule of Philippine history and culture! Sad to say, my camera is still out of commission, and I had to borrow Ivan ManDy's camera to take shots. There are more but I will have to meet up with him to get the files. Our first stop was Norte or the Manila North Cemetery. Before the Libingan ng mga Bayani, there was Norte. And that explains the heavy concentration of who's who in Philippine society in it such as revolutionary generals honored in the Mousoleo de los Veteranos de la Revolucion (photo at left) together with other prominent Katipuneros; Philippine presidents Sergio Osmena, Manuel Roxas and Ramon Magsaysay, senators Isauro Gabaldon, Pedro Guevara, Claro M. Recto and Gerry Roxas, House speaker Quintin Paredes, Malolos Congress delegate Benito Legarda, former Manila mayors and other prominent politicians who led our nation during a time when being called a politician was an honor; renowned boxer Pancho Villa; and big names in the arts such as painter Felix Resurrecion Hidalgo, composer Julio Nakpil, architects Arcadio Arellano and Juan Nakpil, and the giants of Philippine cinema which includes Fernando Poe, Sr. and just recently, Fernando Poe, Jr. Prominent foreign citizens can be found here as well including well-loved American governor-general Francis Burton Harrison. Each stratum of society was represented, with special plots reserved for certain groups such as the Jewish cemetery, the Masonic burial grounds, the military and police plot, the Thomasites' plot, and that of the twenty boy scouts who died in a 1963 plane crash on their way to the 11th World Jamboree in Greece. Their names are memorialized in a series of streets in Quezon City. 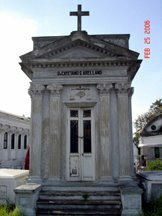 The tombs and mausoleums are reminders of an architectural era gone by, designed by the best architects of their time and rendered by top sculptors and builders. From art deco to neo-romanesque and neo-gothic, these monuments stand-out as cultural relics. But Norte is just the tip of the iceberg and our next stop was an even more exciting collection of architecture, a fusion of East and West that results in an ecclectic mix of architectural style and detail only found in the Philippines. And one can never prepare himself for the surprise that beckons at the Chinese Cemetery on a first visit. 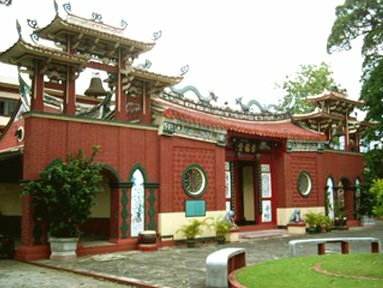 The 54-hectare neighbor of Norte, with areas known as Millionaire's Row and Little Beverly Hills, and temples and monuments to heroes and martyrs as well as grave villas all around, the Chinese Cemetery is a cultural treasure. Indeed I was not prepared for what I was going to see. Cultures mix in every corner, with Buddhist, Confucian and Taoist practices blended in with Catholic tradition. I was surprised to see Catholic images hidden behind Taoist deities at the country's oldest Chinese temple, the Chong Hock Tong temple (photo above left). The group was lucky to see the arrival of a Chinese funeral procession with all its pomp and pageantry. And yet the tolling of the temple bells was distinctly Catholic. Near the temple were various monuments to war heroes and martyrs. 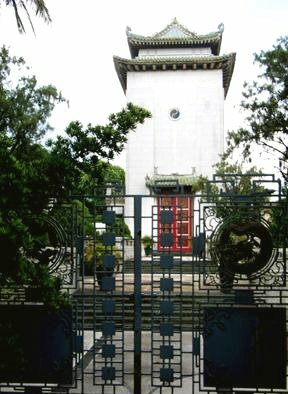 Most imposing of these is the Japanese War Memorial Mausoleum (photo at left), a large hall with photos of ten Chinese community leaders who were executed by the Japanese at the onset of the Second World War. During the Japanese invasion of China in the 1930s, nationalistic passions among the Chinese was very high and these leaders called for a boycott of all Japanese products. Little did they know that the Japanese had them on their watchlist. So when the rising sun arrived in Manila, they were the first to go. Speaking about executions, the cemetery was witness to many of them during WWII. Have you ever wondered who that lady in the 1000-peso bill is? That is Girl Scouts organizer Josefa Llanes Escoda who was martyred in the cemetery. Her name is one in a list of prominent Filipino and Chinese-Filipino citizens martyred in the grounds which includes literary geniuses Rafael Roces and Manuel Arguilla, and Chinese Consul General Yang Guangsheng. Behind the mausoleum are more memorials to war heroes. Moving up and down the alleys and roads of the Chinese Cemetery makes us wonder what ever happened to the architectural savvy of today's Filipino. From burial mounds and traditional Chinese architecture, to East-meets-West fusion architecture that can't be found anywhere else in the world, to sleek Miami-inspired buildings that would get you loco over art deco, the clean and streamlined post-war modernism, the funky 1970s and 1980s post-modernism and today's 21st Century structural modernism, outstanding examples of these styles and even more can be found in the Chinese Cemetery. Size and detail of structures are testaments to the status and wealth of the owners when they were among the living. 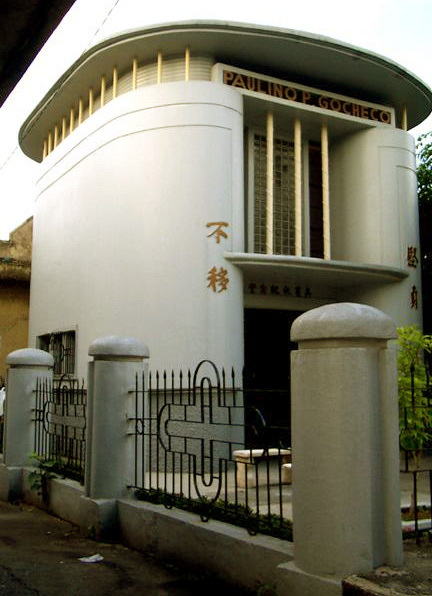 It is no surprise for example that Chinabank founder Dee C. Chuan had a towering deco edifice for his final resting place (photo 2nd from left). Each mausoleum in the art deco area is a work of genius. Who could miss for example Paulino Go Checo's spaceship deco (photo at left). 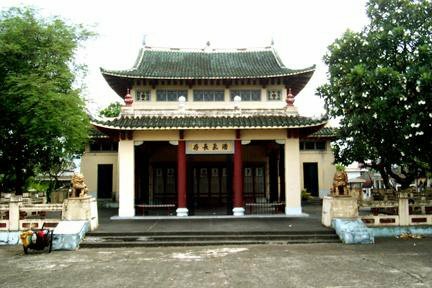 There also mausoleums of Chinese-Filipino personalities and under this category is that of "mami king" Ma Mon Luk, one of the cemetery's more popular residents. More photos in Ivan ManDy's webshots page. I did hear one trivia about the Chinese Cemetery though... that it is the most expensive piece of real estate in the country! Anyway, one really needs a lot of time to explore the place in detail. Maybe next time since we had one last stop for the afternoon cemetery tour. If Norte is the secular cemetery, the last stop was the main Catholic cemetery of Manila. To cap the day was a visit to the last of the three neighbors, the Campo Santo de la Loma. 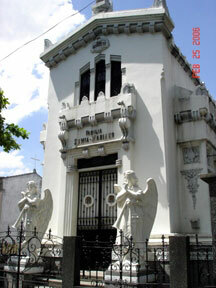 The La Loma Cemetery sits on a hill that bears its name. Near the old entrance is the 19th Century chapel of St. Pancratius (photo at left) which has already been decomissioned with the construction of a modern parish church near the new entrance. The chapel was locked but I was curious what could be found inside. I guess the photos of La Loma can speak for themselves so here is the blog of my tokayo which he has filled with La Loma's architectural works of art. Buried within La Loma's walls are more who's who to add to our growing list. 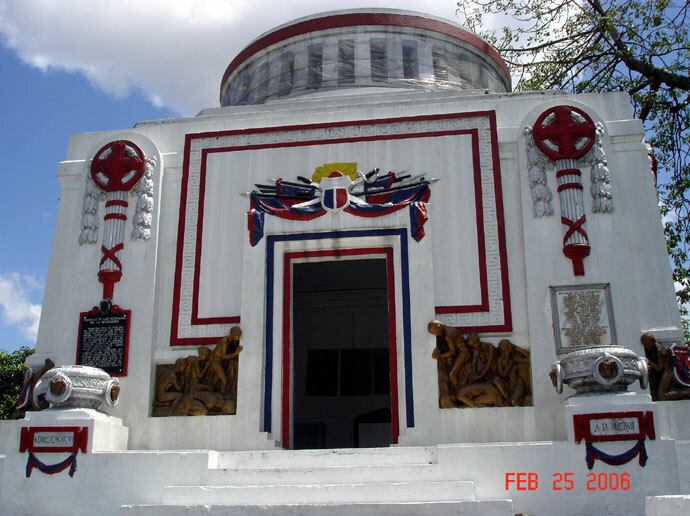 I remember seing among others the mausoleums of chief justices Cayetano Arellano (photo below) and Victorino Mapa, and Malolos Congress delegate Pablo Ocampo. There are also a lot of prominent Kapampangan families who've chosen this cemetery as their final resting place. There are the Pamintuans of Angeles, the Dayrit y Pamintuan and Salgado clans of San Fernando (revolutionary women Felisa Pamintuan Dayrit and Teodora Salgado-Ulmann are buried in La Loma), and the Alvendia y Guanzon clan of Sta. Rita and Floridablanca. Norte also has Kapampangan families such as the Escaler y Ocampo clan of Apalit and San Fenando. Also in La Loma are the parents and siblings of Rufino Cardinal Santos of Guagua. I was surprised to find members of my own family there, Maria Santos vda. de Pekson (the eldest daughter of my great-great-grandfather Don Mariano Leon Santos y Joven) and her two daughters who both died in a plane crash in 1946. I wonder who visits since they died without children. The three cemeteries of La Loma hill should be declared a part of our national heritage. They are repositories of our history, heroes and heritage, and should thus be protected and preserved for future generations of Filipinos. Other cemeteries worth visiting in Metro Manila are the Paco Panteon (now known as Paco Park), the Libingan ng mga Bayani and the Manila American Cemetery and Memorial. 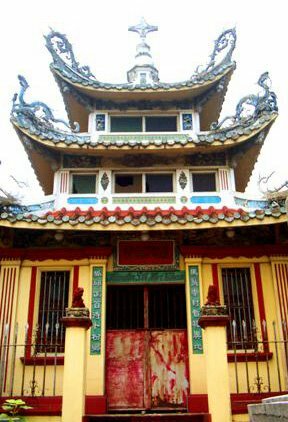 Photos of Chinese Cemetery courtesy of Ivan ManDy. 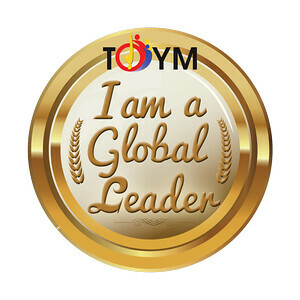 Hey, this is cool! I never thought visiting cemeteries in the Philippines could be such an educational experience. Very well written too, and the photos are lovely. Hope you can do something about Palawan's crumbling Spanish forts too. I'd love to check out those old forts in Palawan. But I'm sure that would be a little expensive since you have to go island hopping around the province to do that. A good resource for Philippine forts is "Fortress of Empire" by Fr. Rene Javellana, S.J. i like your site. it's very informative. keep it up! I am searching for information about the « north cemetery “ in Manila, a huge cemetery where a small city is settled , with people living inside. I would like to make a report about their everyday life, and the way they live in this place. For that, of course I need to get in touch with someone who knows them and can put us in contact with this people. If you know someone, do you please let me know? ?..